The second Pyracantha gave up the ghost this summer. The first one died years ago. Neither of them was in a good place, planted under the eves where even when it rained they probably got no water. The passing of the first one never bothered me, and the demise of the second was neither a surprise nor a disappointment. They are non-native invasives. Good riddance. With a week of vacation ahead of me, I went outside to dig up the second one. I lopped off a branch. And then I leapt back. There was a creature lurking there. There behind a sprig that was still alive. There behind the non-native, invasive berries. There on the wall of the house, certainly taking advantage of the warmth to counter the cold front that had just blown in. There was a prehistoric eye staring at me. I pulled back the bush thinking it was pinned to the wall. It didn’t move. I poked gently at it. It moved lethargically. So it was alive. But heck, it was cold. That’s what cold blooded creatures do when it gets cold: they stop moving. So I left it alone. Hours later, Trudy returned from the store with a reptile cage. She wasn’t convinced by my point of view. She was worried about the lizard, thought it was hurt. She wanted to let it get better. So we put some mulch it the cage. And two sticks. And a Pine cone. And I went outside to get the lizard. I pulled back on the pyracantha and picked it off the side of the house. It didn’t flee, but after I had it in my fingers, the lizard started twisting and bending and turning its head and snapping its jaws. It turned and twisted, and each time the lizard managed to assess the geometry of the situation better. Each time, its snapping mouth seemed closer to my fingers. It is at this very moment that the Fair and Industrious Trudy came out with the reptile cage into which I promptly deposited the lizard, and we took him inside. The story ends well, we think, for the lizard. As it warmed up, it became more active. And as it became more active, we convinced ourselves that there was nothing wrong with it. 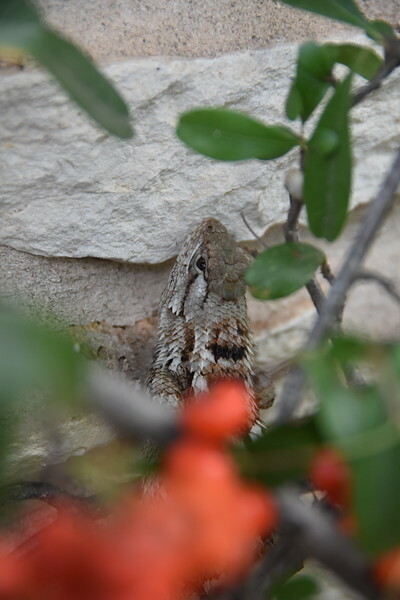 So although we’ve never seen a Texas Spiny Lizard ever sitting still on the side of our house, we figure that the lizard knew that the neighbor’s cat was on the prowl (much to our dissatisfaction) — that the cat had the lizard pinned down. And that since it was cold outside, the lizard couldn’t dash off in the way that Spiny Lizards usually do. So we release our guest into the undergrowth of the backyard, hopefully far enough away from that cat (for a while, at least), that a refuge might be found. It watched us warily from the cage after we opened it. It moved slowly at first, unsure perhaps of what this new turn of events meant. And then with a poke or two from some Pine needles, it dashed under some wood. And we probably won’t see it until next spring.